It seems that weddings require endless amounts of planning. One more task to add to the list is a more enjoyable one – the bridal shower. Traditionally thrown by a friend/the Maid of Honor, this is an event many enjoy. 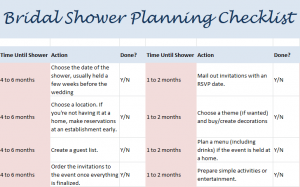 The Bridal Shower Planning Checklist is an easy way to organize the fun event through streamlining your actions. This checklist is very general because of the many different types of bridal showers. There are surprise showers, co-ed showers (for both the groom and the bride), traveling events, and more. This list covers the most common practices of bridal showers that are held at home or at a restaurant, and organized by the bride or a close friend or family member of the bride. The most basic place to start is deciding where you want the shower to take place. Having it held at a private residence allows for much more customization, however a restaurant is much easier to manage a shower at. Choose whatever you feel is best for everyone’s preferences and budgets. Events and activities are crucial to a bridal shower. Before the shower, get the bride and groom to fill out a questionnaire about their relationship – IE when they met, how they met, etc – and then quiz the bride at the shower to see if she put the same answer as the groom. You can also hire entertainment such as tarot readers or a hypnotist for fun. Whatever you decide to do, the most important aspect is to make the event a light-hearted and fun time for the bride and her guests. It’s a simple celebration for the bride’s happiness, so choose what she likes best.